The money raised by the annual Maytime Fair has helped provide targeted support and training that empowers women, men and children to develop the skills, capacity and resilience they need to live full and free lives. 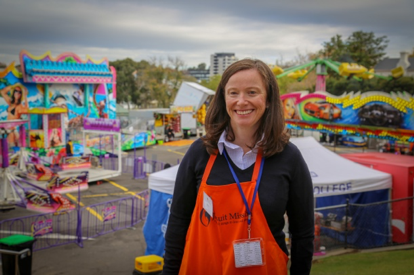 Jesuit Mission’s major annual fundraiser, the Maytime Fair, will be held at Melbourne’s Xavier College on 4 May 2019. Thousands of attendees support the fundraiser each year, with all proceeds going directly towards the work of Jesuit Mission overseas. Since the year 2000, the Maytime Fair has raised over $2.8 million for the charity. Many of the fair’s offerings, which include fresh produce, preserves, baked goods, crafts, carnival rides, auctions, competitions and entertainment, are donated at little to no cost by vendors. Hundreds of volunteers prepare year-round, baking, cooking, creating, gathering and preparing goods to be sold. Jesuit Mission supports projects across Cambodia, China, East Timor, India, Myanmar, Pakistan, Thailand, the Philippines and several countries in Africa. The money raised by the Maytime Fair has helped to provide a range of targeted support and training that empowers women, men and children to develop the skills, capacity and resilience they need to live full and free lives. For Xavier College, the event has historical significance, having been held on the first Saturday in May every year since 1951. Service is a key component of a Jesuit education. It has been calculated that by the time a year 12 cohort graduates Xavier College, they will have completed a combined 26,000 hours of community service. Many students will again be volunteering their time at the Maytime Fair in an effort to make it another wonderful success for Jesuit Mission. Location: Xavier College, Senior Campus, 135 Barkers Road, Kew, Vic.